Princess Haya Bint Al Hussein is the second wife of the Dubai ruler Mouhammed Bin Rashid Al Maktoum - it's a norm for a man in UAE to have more than one wife, if he can afford to provide for them and their kids. Anyway, Princess Haya is the daughter of legendary in the Middle East Queen Aaliya and King Hussein of Jordan. Her mom died tragically in the plane crash back in the 70-ies. The airport in Jordan is now named after Queen Aalia. 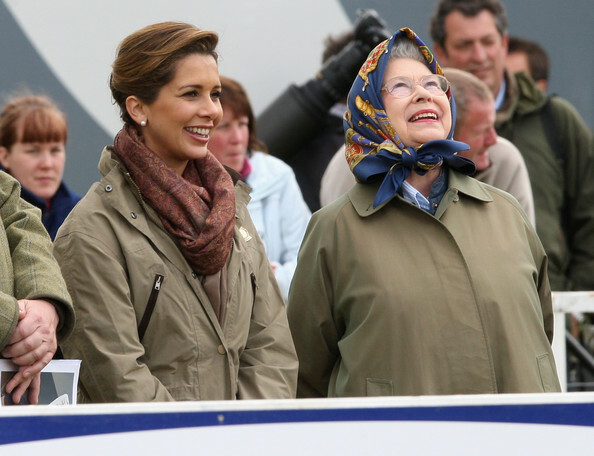 I think Princess Haya looks a lot like her beautiful mother. Princess Haya is current King's of Jordan half-sister and thus, sister in law to Queen Rania. Since the first wife of the Dubai ruler prefers to live according to traditional, conservative emiraty customs - very-very private - it's Princess Haya who accompanies her husband to all of the social functions, both in Dubai and abroad. In 2000, Princess Haya competed in Sidney Olimpics, in the Equastrian Competition. She also was qualified for 2004 Olympics in Athens, but i don't think she competed that year. Interesting fact: Princess Haya is the only member of Jordanian Royal Family to be a member of Taxi and Truck Drivers Union. She is also the one and only woman in Jordan who can legally operate heavy machinery. Besides such impressive athletic resume, she is also on board of various local charities, from kid's orchestra to youth sports organizations. She is also involved with UN and UNICEF.